Wood garage kits are a popular option for residential garages, for several reasons. Nothing beats the "warmth" of real wood, and wood is the residential building material of choice in many regions and neighborhoods. It is plentiful, easy to work with, and relatively inexpensive. It is also a renewable natural resource. Many do-it-yourselfers are more comfortable working with wood than with any other building material. Even someone with almost zero carpentry skills can build a wooden building from a kit. For most types, only basic hand tools are required, and all you have to do is follow the instructions. Wooden garage kits offer a considerable time savings over stick-building one from scratch. Pre-cut stick built garage kits: Some kits come as stacks of lumber that has been pre-cut, and you do all of the actual construction. This is just like stick-building one yourself, except the lumber is already cut to size for you. This saves you time by not having to measure and cut each board individually, and also reduces waste from accidentally cutting boards too short! The pricing on some of these wood garage kits is very little more than what you would pay for raw materials to build a simple one from scratch with regular lumber. One source for pre-cut stick built kits is BudgetPackaging.com. Panelized garage kits: Other wooden garage kits come with the wall framing already pre-assembled into panels. With some, the siding is already attached to each framing section, speeding up the process even more. Many of these kits are for smaller structures, but it is possible for two or three people to assemble one of these in a weekend. These are more expensive per square foot than the pre-cut stick-built wooden garage kits, of course. Some use premium materials, driving the price up even more. JustGarageKits.com is one source for panelized kits in the US and Canada, and BudgetPackaging.com also has 2-car panelized kits available. Modular garage kits: This type of wooden garage kit is more of a pre-fab building than a kit. It is delivered to you already assembled. Single car units are essentially just rolled off of a trailer and then fastened to the foundation. Multi-car modular garage kits are delivered in single car sections that are set down side by side, and then attached together like a double-wide mobile home. You can also get a two story modular garage kit. Some modular garages come with wooden floors, which probably isn't the best idea for automotive work where there will inevitably be fluid spills. Floor jacks and jack stands may also damage a wood floor. A wooden floor should be fine if you are just using it for parking. These pre-built garages are hands-down the quickest way to get a new building. 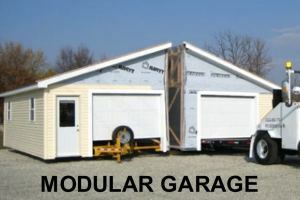 For more information, visit our page on Modular Garages. There are also a number of videos on YouTube showing how they go together and get set up. It is best to use a relatively local company for this type, because transporting one of these buildings a long distance would be quite expensive. Wooden pole building kits: A pole building kit is in many cases the least expensive way to build a garage. Although the typical pole building kit comes with metal siding, there are companies that offer all wood pole building kits. Most pole building kits use wooden posts as the main structure, and horizontal slats called girts are attached to the outside of the posts. The siding is then attached to the girts. A pole building kit can use rafters, wooden trusses, or open web steel trusses for the roof structure. From the outside, they can be made to look just like a traditional stick-built wooden building, or a barn or log cabin if you prefer. Take a look at my page on Pole Barn Kits for more information on this type of kit. BarnPros.com has some really neat packages on their website, too. 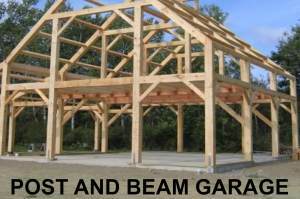 Post and beam garage kits: This is how our forefathers built their houses and barns! Also called timber frame construction, post and beam garages are very similar to pole buildings in design, but use heavy wood beams for the structure. This type of wood garage kit allows you to have an attic or loft, or even a full second story, which most pole building designs do not. The heavy wood beams mean there aren't as many components required in the roof support, and they almost always have real wood or log siding. One advantage of a post and beam garage is that you can have 8' side walls and still have an automotive lift that fits between the ceiling beams. A post and beam building is a great choice if you are going for a rustic or barn style look. I could spend hours drooling over some of the designs at SandCreekPostAndBeam.com and CountryCarpenters.com! I am originally a country boy that grew up in the mountains of Virginia, and I love the old rustic, country-style architecture. It reminds me of my grandpa's barn. Log Garage Kits: If you live in a log home, then a log garage kit is a natural choice. Many log garage kits are not actually made from logs, but use log siding instead. Log siding can be installed on the outside of any of the above types of wood garage kits. Most companies that sell log home kits offer a log garage kit also. BarnPros.com has pole-barn type wooden garage packages that come with log siding. When comparing wood garage kits, make sure you pay attention to what is included and what isn't. Many of the kit prices do not include shingles, roofing nails, roof felt, etc., and may not include doors or windows. Some include wooden floors, but others are designed to be built on a concrete slab. For information on other types of garage kits, explore our Related Pages menu on the right near the top of this page. If you are not much of a carpenter or are just looking to save some time, wood garage kits are definitely worth a look.